New York - Sotheby’s 2019 Americana Week auctions concluded yesterday in New York with an outstanding total of $21.3 million - our highest Americana Week series total since 2007*. Led by a printing of the celebrated William J. Stone reproduction of the Declaration of Independence that achieved $975,000, over 1,250 lots spanning more than five centuries of American history were sold over the course of five auctions. The week began last Thursday with the first session of Important Americana, which offered a diverse array of silver, Chinese export ceramics and prints. The following day, on 18 January, more than 280 exquisite pieces of furniture and decorative objects from the collection of Nelson & Happy Rockefeller realized an impressive $3.3 million, led by a superb ensemble of Chinese export porcelain. Over the weekend, Sotheby’s presented the Collection of Anne H. and Frederick Vogel III - one of the finest assemblages of early Americana and early English pottery, which brought $4.2 million, with an outstanding 94.4% of lots sold. On Sunday, the important American folk art collection of visionary collector, David Teiger, achieved $2.5 million with proceeds to benefit Teiger Foundation — soon to be one of the world’s largest Contemporary Art foundations. The day continued with our second session of Important Americana, which totaled $6.8 million and was topped by a notable selection of fine furniture from distinguished private collections and institutions. Our success across all categories was sealed yesterday, with our dedicated offering of Fine Manuscript & Printed Americana achieving $4.5 million, led by exceptional historical documents that bear witness to the full sweep of American history. Yesterday’s Fine Manuscript and Printed Americana sale offered an impressive span of historical documents and artifacts chronicling the history of the United States from the colonial period through World War II. The Americana Week series was led by the only known privately held copy of the celebrated William J. Stone facsimile of the Declaration of Independence for which provenance can be traced back to a direct ancestor who received it in 1824. The historical printing sold for $975,000 (estimate $600/800,000), acquired by Mr. David Rubenstein to be loaned to a Washington, D.C. institution. As the original Declaration became increasingly fragile, then-Secretary of State John Quincy Adams commissioned William J. Stone to engrave a facsimile on a copper plate in 1820. The present printing is marked by its exceptional provenance - it has descended through the family of its original recipient in 1824, Thomas Emory (1782-1842) of Maryland, through to the present owner. Adams may have presented this Stone Declaration to Emory in order to help win Maryland in the hotly- disputed presidential election of 1824. 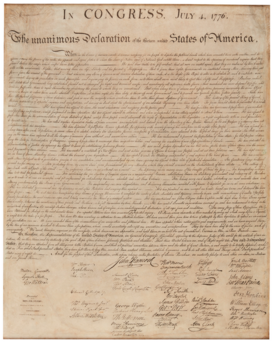 Earlier in the sale, probably the finest copy extant of the first book-form printing of the Declaration of Independence sold for $471,000 (estimate $300/500,000). Done by patriot printer Robert Bell on 8 July 1776, the present copy had descended through the family of a French officer serving in the American Revolution. A broadside printing by John Dunlap of the official proclamation of the Treaty of Paris, signed by the President and Secretary of the Continental Congress, was another star of the auction series, selling for $855,000 (estimate $800,000/1.2 million). The broadside carries the complete, official text of the articles of peace signed at Paris that brought the Revolutionary War to an end, signed in type by David Hartley for Great Britain and by John Adams, Benjamin Franklin, and John Jay for the United States. Additional highlights across yesterday’s sale included a first edition, second state, original hand-colored copy of Paul Revere’s famous Boston Massacre print from 1770, an icon of the American Revolution that brought $362,500 (estimate $150/200,000), as well as a collection of personal items owned by the Marquis de Lafayette that descended through the family of his granddaughter to the present owners. The group featured a portrait of Lafayette at age 15, sold for $81,250 (estimate $25/35,000), as well as Lafayette’s mourning ring worn in memory of his “adopted father” George Washington, which brought $50,000 (estimate $25/35,000).